Baseball is a sport of the haves and the have nots. It's one of the only sports without a salary cap, which leaves small market teams a tough time of getting on top and staying there for long. The Royals, Indians and Pirates have found ways to get competitive with low budgets. These teams have not only found what was in the past to be competitive, even having dominating runs that ended in 98 game-winning seasons and even two of those three going as far as appearing in the World Series. As a 29-year-old baseball fan in Pittsburgh, I have not had a lot to be excited about when it came to the Pirates. The past few years gave the city hope and passion for baseball again. This season the Pirates are still in the playoff hunt even though they are currently standing five games under .500 at the All-Star break. Some are concerned about the direction of the Pirates and the future of the organization. There is a split among the city on how we should treat this trade deadline and to be quite honest a lot of the future could be decided for this organization come Tuesday, July 31st. Jaso has been one of the unexpected surprises during the dismal first half of 2017. The million dollar question is, what should the Pirates do? The very best thing they can do is at this trade deadline is build for next season. Every Pittsburgher is sick of hearing about "next season", but hear me out: there are too many needs for the Bucs to “go all in” this season. There is a need for an everyday third baseman, another starting pitcher to add to the rotation and possibly a left fielder for the possible playoffs. Things could be a lot different if we had Marte and Kang this year as Marte is set to come back soon but would be out for the playoffs. That would give you Freese, Jaso and Frazier off the bench, which is a great bench to call on. The problem is, the only way to obtain all these assets is to mortgage your future and future earnings for a crap shoot this season. Even if the Bucs made the playoffs, they are not deep, and they would have to give things up to get said pieces to help them get that stage. Worst case scenario would be to go all in and lose in the first round, which is very likely considering what the team can afford and give up to remain competitive in 2017. Next season with the starting three pitchers we have: Cole, Nova, Tallion. Adding in Marte and Kang back possibly, along with Harrison and others, we have a solid core coming into next season to build off of with the add-on of being in an awful division. Only person slated to move this offseason is Jaso, although he has had a good season. Adding Freese, Osuna and Frazier to bench roles, the team starts to take a much deeper form. That is if they only get back who they originally should have had starting this season. With that core and adding via the July trade deadline and possibly adding small contributors in FA this off-season, 2018 looks better and better. Two bullpen players come to mind with this: Tony Watson and Juan Nicasio. With Watson's play, I don’t see the Pirates getting any takers for him so I believe he will play out his contract but Nicasio on the other hand has been a very solid set up guy this season and should command some type of value in return. Nicasio is set to be a free agent this offseason and will be priced out of the Pirates' pocket book. Trading him while you can get something in return is the key here. Everyone is looking to add to their bullpen come the trade deadline and should be easy to find a suitor willing to go all in for this year on a rental player and give a decent prospect to help fill out the farm system. Rule #2: Selling bad contracts to free up money. 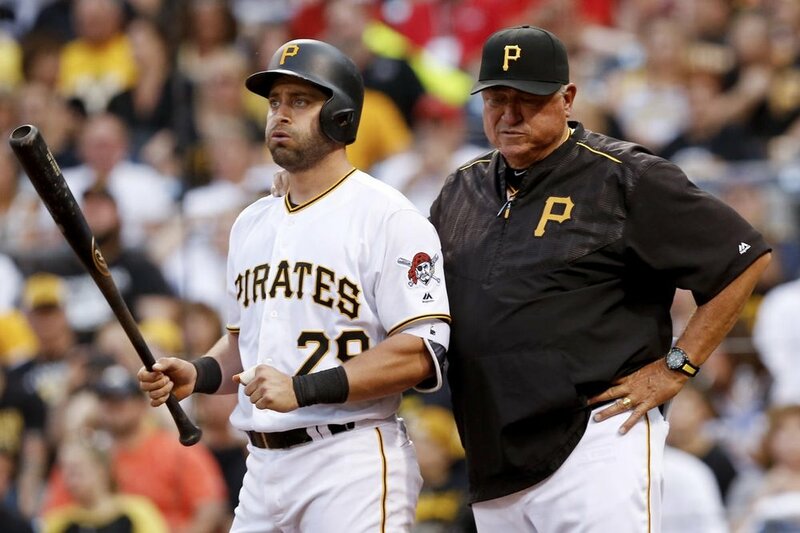 A personal favorite of mine is Francisco Cervelli, who has not lived up to his contract extension last season and with the emergence of Elias Diaz this could make Cervelli expendable. Teams like the Indians, Rangers, Mets, Astros and Red Sox are all looking to be buyers with lack of productions from their current depth chart at the catcher position. This would shock most fans but could be smart move to get younger and cheaper while maintaining the same level of play both defensively and at the plate with Diaz. The hardest rule for a GM is this one. The face of the franchise, the reason butts are in the seats, the MVP Andrew McCutchen is the perfect trade candidate for this rule. There is no easy way to put this but the Pirates cannot keep Cutch. Cutch is going to demand a lot of money that is not worth the percentage of the payroll he would take up on a small market team. Look where the Pirates are with him? Not that great of a spot being under .500, we can be under .500 with younger, cheaper talent that will build for next season. Also, people are not coming to the games; it’s about winning and losing for Pittsburgh. With or without McCutchen the tickets will sell once they start winning again. Let's also add that Cutch will be moved to left or right field next season when Marte is back full time, with an extension to Cutch you would be paying a left fielder $20- 22 million a season. That is way more than the Pirates payroll can handle. By moving him this trade deadline as hot as his bat has been, the Pirates are giving up a solid player with a very reasonable salary for the next 1.5 seasons. This will demand a lot in the Pirates favor, something that can help you next season and beyond. Once you move on from Cutch, you finally bring up Austin Meadows who is the number 1 prospect in the Pirates minors system and is as highly ranked as 9th overall for MLB prospects. At some point you have to see what you have in the kid, who yes has been injured on and off, but last season was very solid with 12 HRs and an OPS of .869 with three levels of play. Though he has not had the best bat in the minor leagues this year, Meadows is shining at all outfielder positions with a fielding percentage of 1.00. If the Pirates make these type of trades (especially the Cutch trade) they should get back at least a young starting pitcher that is ready to join a struggling back end of a rotation. Also acquiring some added depth to the club both Major league roster as well as farm system. With Meadows, Bell, Kang, Marte, Osuna, Freese, Harrison and three young starting pitchers, the 2018 Bucs could be looking down atop of the NL Central, and not just for one yea,r but for some time. The time to sell and sell smart is now. Pirate fans need to understand how to play the game of a small market GM. Cherish the memories, but cherish winning at all cost. Coach W. attended California University of PA where he achieved a degree in Sports Management. His background in football includes working in the front office for the Pittsburgh Power for one season followed by coaching at the minor league football level for three years with the PIttsburgh Colts.